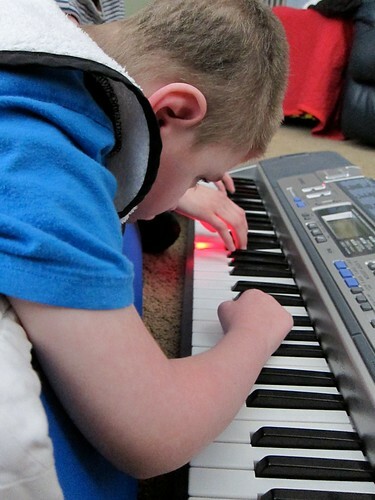 Max has been given a grant through the Professionals Miracles Foundation to help pay for his music therapy. 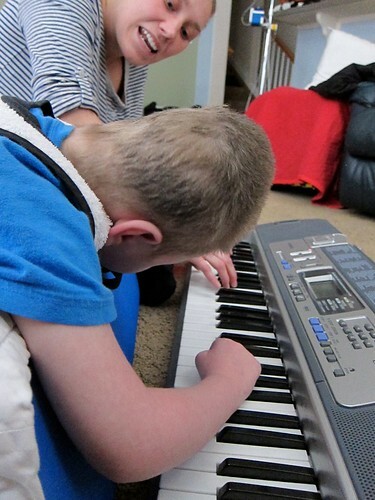 This means, we are able to have his music therapist, Laura, come weekly rather than just twice a month! Yesterday, he was really enjoying his time on the keyboard, playing along to the "Max Song" that Laura was singing to him. I loved how much he was watching the keys, and using his hands to play along. The camera battery died to get a good video of him jamming on his drum after the keyboard, but Steve got the last bit on his phone video. I'm so thrilled we're able to do music therapy weekly now! It's one of his favorite things all week. He insisted he needed to play his drum in physical therapy, occupational therapy, speech therapy, and school today. They have each incorporated it into their times because they know music is one of the best things to motivate him. way to go Max, so neat to see you playing your music. SO excited for you guys! I hear such great things about music therapy!